Winter is quickly approaching, and that means pretty soon the outside temperature is going to plummet. Many homeowners make the mistake of neglecting to care for the property during the late fall and winter months. Although it is considered to be the dormant season for many perennials, trees, and shrubs, it is important to realize that cold damage to plants is always a genuine possibility. For that reason, here are some ways you can protect your shrubs from colder weather. Generally speaking, a plant is going to experience the most damage on the side of it that faces the wind and sun. When planting new shrubs in your yard, try to place them in sheltered locations that are away from harsh winds and direct winter sunlight. If you have some existing shrubs in exposed locations in your yard, you can still create a makeshift barrier using materials like burlap or canvas. It is essential that you adequately water your plants before the ground freezes over. This is because you want your shrubs to have adequate soil moisture as they enter the winter months. After thoroughly watering your plants before winter, apply a layer of mulch around your shrubs to help retain some of that moisture. Many homeowners are under the misconception that none of their property’s plants need to be watered during the winters. Several plants still depend on water during the colder parts of the year. You want to stay mindful of the precipitation and supplement your shrubs with water when necessary. Many species of evergreen require water on occasion during the winter because they lose a lot of it through transpiration. Sometimes, parts of shrubs become desiccated. This will occur when a plant loses water at a faster rate before its roots can take in to replenish it. In the case of evergreens, desiccation will make them take on an unpleasant rust or brown color. DeWitt’s 1.5 oz. N-Sulate”! 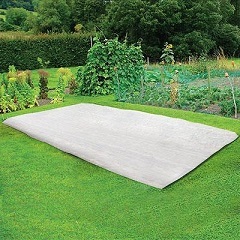 is UV treated fabric designed to protect gardens’ flowering annuals, bedding plants and vegetables from the freezing temperatures. This fabric installs easily and is reusable. As soon as you hear that freezing weather is approaching, it is important that you take action. There are a few protective measures that you can use for your shrubs. Your first step should be to water your plants the day before a freeze. You also should think about covering your shrubs entirely with burlap or canvas sheets during cold spells. This entry was posted on Wednesday, November 15th, 2017 at 12:41 pm. Both comments and pings are currently closed.